The magic of Christmas starts long before Christmas Eve. Weeks before celebrations begin, people all over the world have already begun to observe their traditional customs, along with rituals all their own. The PanoMaticLunar in red gold and the snow-white PanoMatic Luna ladies' watch, fitted with a new mother-of-pearl leather strap, celebrate every moment in the days and weeks before Christmas, under the Christmas tree, and a whole life long. 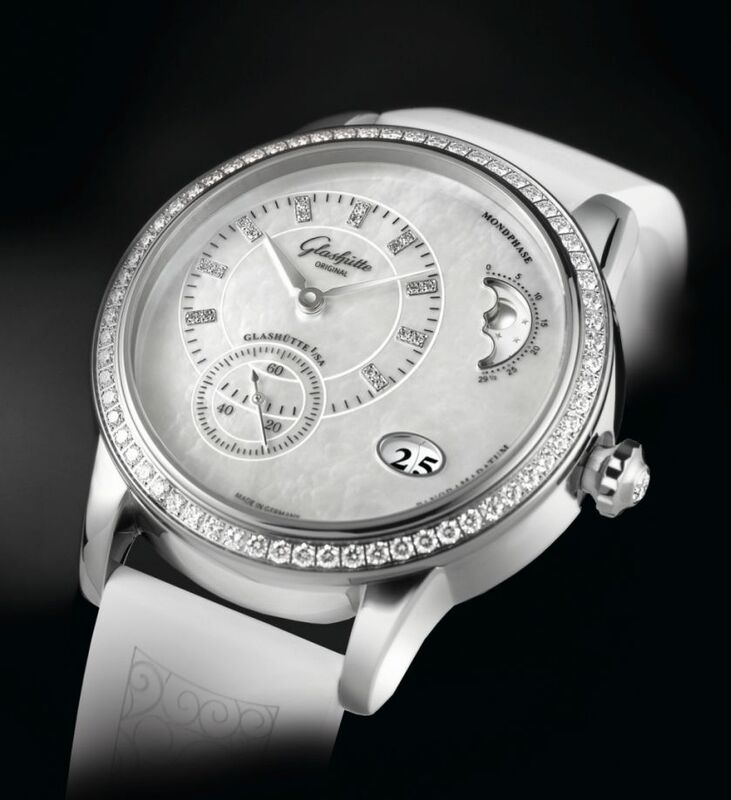 The PanoMatic Luna in radiant white, for example, appears in the role of a true ice princess. A razor-thin mother-of-pearl dial provides a graceful backdrop to the off-center hours, minutes and small seconds displays, and is at once a canvas for two of the watchmaker's signature complications: the moonphase display, and the rounded Panorama Date. Diamond indeces ensure luxurious reflections of light, in subtle competition with the sparkling bezel, lavishly set with brillant-cut diamonds. Its refined, 39.4mm diameter stainless steel case encloses the finely finished Caliber 90-12 automatic movement, whose beauty can be admired through a sapphire crystal case back. The movement ensures reliable precision even when, once again, time to wrap the presents will soon run out. Rounding off the white splendour is a new leather strap with an iridescent mother-of-pearl finish which hue changes softly with the play of light on its surface. Even more variety arrives with the strap's sophisticated quick-change system, which makes child's play of exchanging one PanoMatic Luna strap for another from mother-of-pearl white to elegant versions in blue or brown leather to rubber straps in white or black. 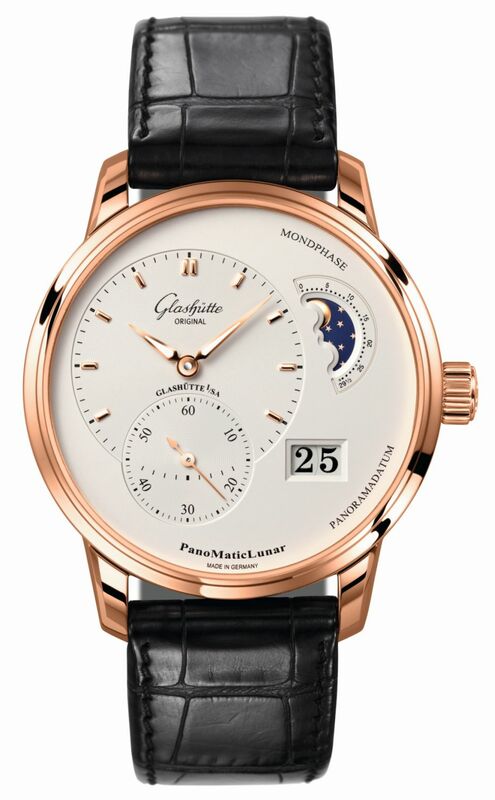 The PanoMatic Luna's counterpart for men presents a galvanic silver dial in a red gold case. Hands and indeces on the off-center displays take up the luminous hue and adorn even the most festive attire. The same is true of the moon phase display at 3 o'clock, the product of elaborate hand-crafting in the watchmaker's own dial manufactory in Pforzheim. There, highly skilled artisans also create the elegant curves of the golden moon, whose domed profile is set off against a night sky in galvanic blue. Celebrating its 20th anniversary this year, Glashütte Original's classic Panorama Date, at 4 o'clock on the dial, elicits a casual, intuitive glance. Beating within the 40mm diameter case is the manufactory's Caliber 90-02 automatic movement with stop-seconds function. 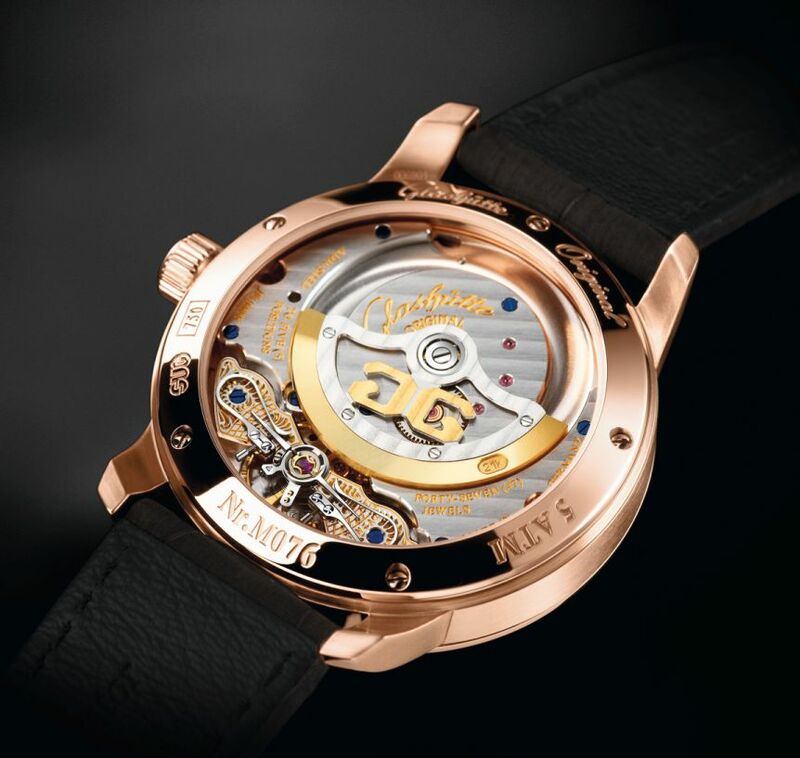 A specially developed sapphire crystal offers generous views of the movement. 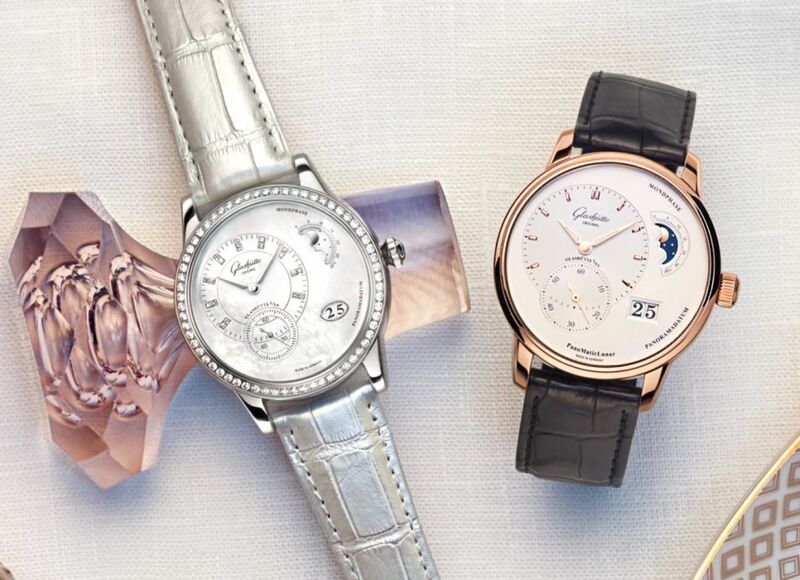 Numerous details, such as the classic Glashütte three-quarter plate with its refined stripe finish, the filigreed screw balance, or the duplex swan-neck fine adjustment, betray their origin at a glance and prove that the watchmaking art from the Ore Mountains is as accomplished, in its filigreed craftsmanship, as the region's famed Christmas decorations. Rounding off the PanoMaticLunar in an elegant fashion is a black Louisiana alligator leather strap.